Pampering sets like these are always a good idea at Christmas, to help you make time for some relaxation! There are different varieties available from Radox to suit whatever your mood! Looking to relax after late-night Christmas parties? 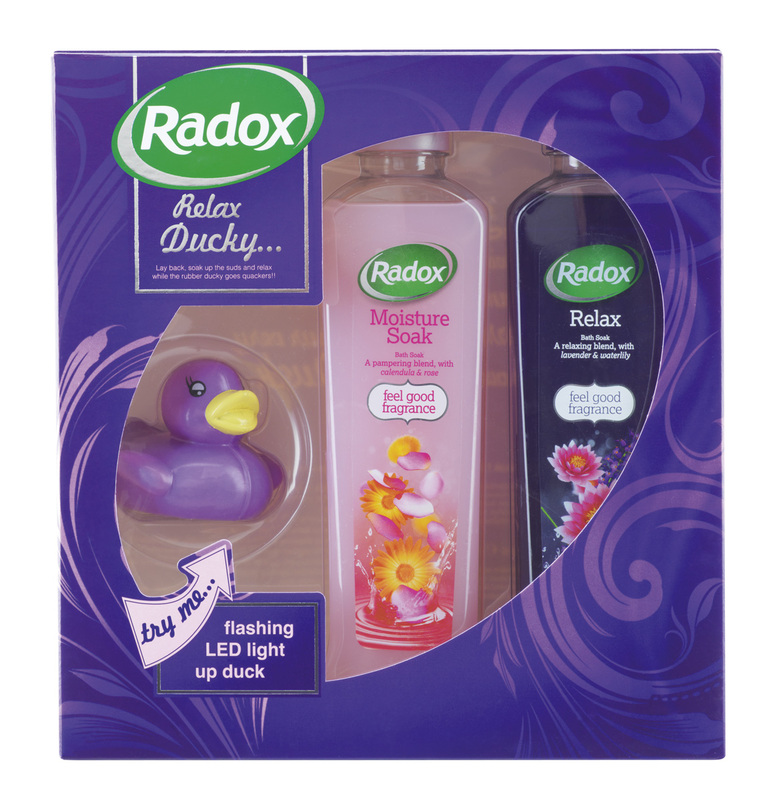 Soothe those aching feet with Radox Muscle Soak Bath Therapy 500ml to help you unwind and get you feeling good. A blend of clary sage and sea minerals will warm your muscles reviving both your body and mind. Feel good fragrance Radox Original Bath Therapy 500ml is also on hand to leave you feeling recharged with the reviving smell of natural juniper and thyme leaving you refreshed this Christmas. Indulge in relaxation this Christmas with Radox Moisture Soak Bath Therapy 500ml. The calendula ﬂ ower and natural rose essence acts is natural conditioner leaving skin soft, renewed and glowing. Paired with Radox Relax Bath Therapy 500ml, a blend of fragrant lavender and delicate waterlily, you will be feeling completely relaxed and refreshed releasing the stress of Christmas shopping. We all know that Christmas is a time to be pampered which is why the Radox Spa gift set is the perfect antidote to the hustle and bustle of this year’s seasonal festivities. It contains a Radox Spa Soothe Bath Soak 500ml and Radox Spa Radiant Shower Cream 250ml with ﬁg and neroli oil, both expertly blended with natural ingredients to deliver visible results to body and mind, along with two indulgent candles for maximum bathtime bliss. It will leave you feeling fresh, revitalised and glowing from head to toe. Relax Ducky, would be the one for me. Radox Relaxation Therapy Gift Pack looks lovely! 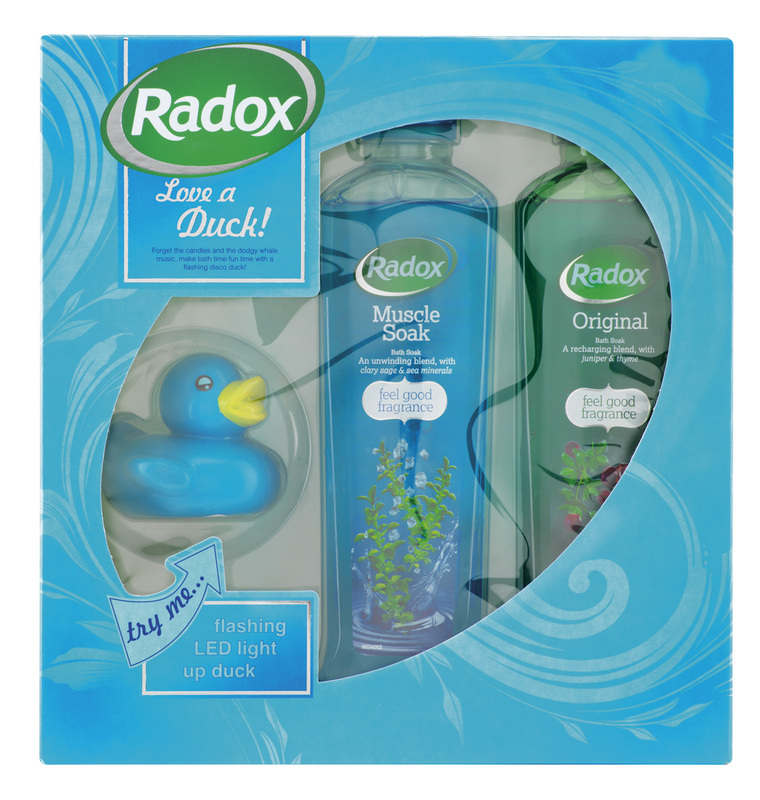 Radox Relaxation Therapy Gift Pack – relaxation and a duck who could ask for more! Relaxation Therapy – need it !! The purple relaxation one. My favourite colour, a cute duck and I need to relax! moolboots recently posted…One of those questions! Radox Relaxation Therapy Gift Pack – The Purple One! Relax Ducky ..Love the duck too! 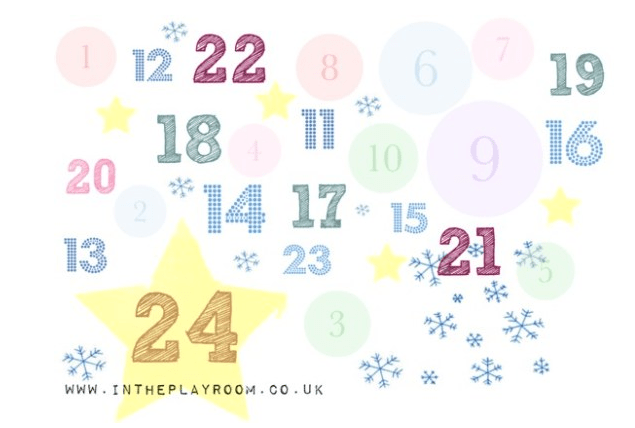 Mummy of Two recently posted…Little Mr A is improving his writing skills! amanda walsh recently posted…Will you be making any Resolutions? They all sound lovely, but I like the purple set best. Radox Relaxation Therapy Gift Pack, because is has lavender and rose. Duck is cute. The relaxation therapy – I am in serious need of relaxing! the pink home spa one looks lovely! 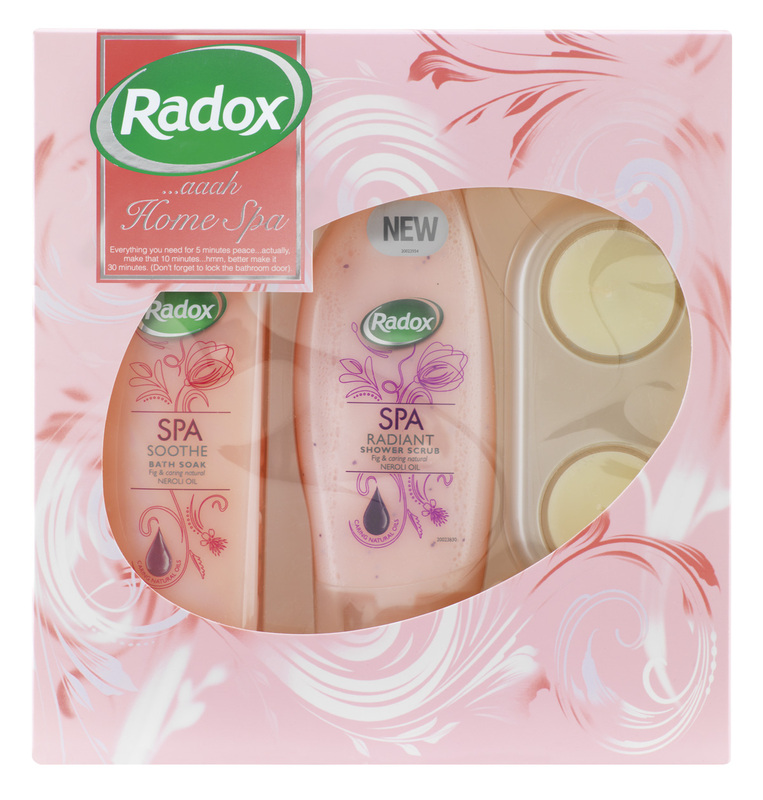 The Radox Home Spa Gift Set looks divine, I can imagine relaxing in a lovely bubbly bath with those candles lit – divine! RADOX IS MY ALL TIME FAVOURITE. A FRAGRANCE FOR EVERY MOOD. JUST RELAX AND ENJOY! relaxation therapy set, need to relax and i LOVE purple! The relaxation gift set, I am an anxious person! Ooooh the blue one with the muscle soak in – I NEED that! Kate @ Family Fever recently posted…Our Makie doll is here! The Blue relaxation therapy looks fab! I like the Relax Ducky set. Radox Moisture Soak Bath Therapy 500ml. The muscle soak Relaxation set looks lovely. the pink spa set x. The Radox Relaxation Therapy Gift Pack – the purple one! Muscle soak for me and my achy back. Kate Davies recently posted…Jacks Christmas list. love a duck..the purple one looks wonderful! The purple with the flashing duck!! Love the ‘love a duck’ blue set, cool, calm, sophisticated ?!!!! Radox Relaxation Therapy Gift Pack – the purple one because the smell of lavender has unpleasant associations for me even though it is supposed to be relaxing. The relaxation therapy gift pack looks lovely. Love a duck because of the muscle soak. The relaxation gift set as I love that fragrance, especially after a long day! Love a duck – ready for when I hit the gym after Christmas! The Radox Home Spa Gift Set 🙂 Merry Christmas! Relax Ducky. All of the sets look gorgeous, but the purple ducky does it for me.